Our Manufacturing Processes I Tests allow you to experience an online examination in the real-time environment. In every online test on Manufacturing Processes I, you will be presented with Multiple Choice Questions (MCQs) which will test your skills in Manufacturing Processes I Concepts in a detailed and comprehensive manner. In the test, each question will have 4 options to choose from. You should select only 1 correct option as an answer and then move on to the next question. Once you submit answers to all the questions, you will be given your final test score. In the Online Manufacturing Processes I Test, for every correct answer, you will be given 2 points. There will also be negative marking of -1 for every wrong answer. So, you will have to be more careful in choosing the answers to the question in your online examination. If needed, you should skip to the next question and come back to the previous question later so that you can do proper time management for the online mock tests. 1. "Manufacturing Processes I Practice Tests" - In Manufacturing Processes I practice tests, there will be a series of practice tests wherein you can test your Manufacturing Processes I concepts on every chapter separately. There will not be any time limit on these tests. So, Manufacturing Processes I Practice Tests should be the first set of tests which you should attempt. Goto these practice tests here. 2. "Manufacturing Processes I Mock Tests" - In Manufacturing Processes I mock tests, there will be a series of mock tests wherein you can test your Manufacturing Processes I concepts on every chapter separately, but there will be a fixed time limit per test. So, it is similar to Manufacturing Processes I Practice Tests, but with an added constraint of time limits. You should try Manufacturing Processes I Mock Tests if you are appearing for any online examination soon. Goto these mock tests here. 3. 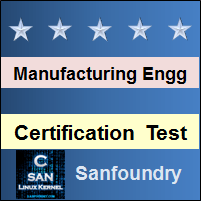 "Manufacturing Processes I Certification Test" - Once you are through with your Manufacturing Processes I concepts, then you should try our Manufacturing Processes I Certification Test wherein Sanfoundry will issue a free Certificate to you if you scored either Grade A* or Grade A in Manufacturing Processes I Certification Test. Goto Manufacturing Processes I Certification test here. 4. 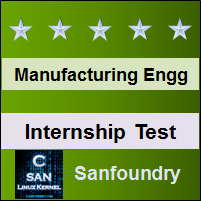 "Manufacturing Processes I Internship Test" - If you are interested to do Internships in Manufacturing Processes I at Sanfoundry, then you must take our Manufacturing Processes I Internship Test. If you scored either Grade A* or Grade A in Manufacturing Processes I Internship Test, then you are eligible for Internship at Sanfoundry in Manufacturing Processes I. Goto Manufacturing Processes I Internship test here. 5. 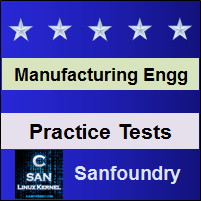 "Manufacturing Processes I Job Test" - If you are a fresher, a dropout, an experienced person and if you know Manufacturing Processes I well and looking out for jobs in Manufacturing Processes I domain at Sanfoundry (or our Network of Companies), then you should try and qualify our "Manufacturing Processes I Job Test". 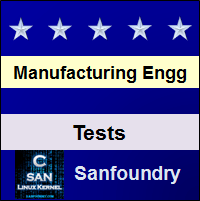 If you scored either Grade A* or Grade A in Manufacturing Processes I Job Test, then you are eligible for a Job at Sanfoundry (or our Network) in Manufacturing Processes I domain. Goto Manufacturing Processes I Job test here. For every "Manufacturing Processes I Practice Test", Total Questions: 20, Total Time: Unlimited. For every "Manufacturing Processes I Mock Test", Total Questions: 20, Total Time: 20 Minutes. For "Manufacturing Processes I Certification Test", Total Questions: 50, Total Time: 1 hour. For "Manufacturing Processes I Internship Test", Total Questions: 50, Total Time: 1 hour. For "Manufacturing Processes I Job Test", Total Questions: 50, Total Time: 1 hour. Before you get started on these series of online tests on Manufacturing Processes I, you should learn, study and practice our collection of 1000 MCQs (Multiple Choice Questions and Answers) on Manufacturing Processes I here. We also prefer that you should practice Manufacturing Processes I practice tests and mock tests completely before attempting the certification test. Here is the list of online practice tests and mock tests on Manufacturing Processes I. Each online test focuses on a "Specific chapter of Manufacturing Processes I". So, you should try both practice test and mock test on every chapter to do a self-assessment of your knowledge (along with time-limit constraints) in every area or sub-topic of Manufacturing Processes I. Manufacturing Processes I Certification test, Internship test, and Job Test are mentioned at the end of this list. 1. Manufacturing Processes I Test 1 – This set of online test on “Manufacturing Processes I” tests your skills on Crystallography-1, Crystallography-2, Miller Indices, Imperfection and Defects In Solid, Mechanical Properties, Mechanical Testing, Non-Destructive Testing, Iron Carbon Phase Diagram-1, Iron Carbon Phase Diagram-2, Phase Diagram, Ferrous Metal, Heat Treatment. 2. Manufacturing Processes I Test 2 – This set of online test on “Manufacturing Processes I” tests your skills on Non-Ferrous Metal, Magnetic Properties of Material, Electrical Properties of Materials, Introduction to Plastics, Introduction to Ceramics, Introduction to Composites, Tool Geometry and Nomenclature-1, Tool Geometry and Nomenclature-2, Tool Wear and Failure, Cutting Tool Material-1, Cutting Tool Material-2, Cutting Fluid and Tool Temperature, Mechanics of Cutting-1. 3. Manufacturing Processes I Test 3 – This set of online test on “Manufacturing Processes I” tests your skills on Mechanics of Cutting-2, Cutting Mechanics, Cutting Forces Power, Tool Wear Failure, Machinability, Cutting Tool Materials, Cutting Fluids and Turning Process, Introduction to Lathe, Lathe-1, Lathe-2, Lathe-3. 4. Manufacturing Processes I Test 4 – This set of online test on “Manufacturing Processes I” tests your skills on Lathe-4, Capstan and Turret Lathe, Shaper Parts, Shaper Mechanism, Slotter, Introduction to Milling, Milling Cutters, Milling Attachment, Milling Operations-1, Milling Operations-2, Milling Methods, Indexing by Milling, Geometry of Twist Drills-1. 5. Manufacturing Processes I Test 5 – This set of online test on “Manufacturing Processes I” tests your skills on Geometry of Twist Drills-2, Geometry of Twist Drills-3, Geometry of Twist Drills-4, Drilling, Reaming, Grinding Wheel-1, Grinding Wheel-2, Grinding Wheel-3, Grinding-1, Grinding-2, Surface Finishing Operations, Electric Discharge Machining. 6. Manufacturing Processes I Test 6 – This set of online test on “Manufacturing Processes I” tests your skills on Electrochemical Machining, Laser Beam Machining, Ultrasonic Machining, Abrasive jet Machining, Other Unconventional Machining, Metrology-1, Metrology-2, Welding Basics-1, Welding Basics-2, Gas Welding and Gas Cutting, Arc Welding, Resistance Welding-1. 7. Manufacturing Processes I Test 7 – This set of online test on “Manufacturing Processes I” tests your skills on Resistance Welding-2, Welding Metallurgy and Welding Defects, Fusion Welding Processes – 1, Fusion Welding Processes – 2, Unconventional Welding Methods, Powder Metallurgy Operations, NC Part Programming-1, NC Part Programming-2, Casting Terms, Fundamentals of Casting, Pattern and Allowances. 8. Manufacturing Processes I Test 8 – This set of online test on “Manufacturing Processes I” tests your skills on Moulding sand, Gating design, Various Casting Process, Casting Defects, Metal Casting Defects, Metal Casting Processes Equipment, Expendable Mold Permanent Pattern Processes, Expendable Mold Expendable Pattern Processes, Casting Techniques Single Crystal Components, Forming, Introduction To Forging and Extrusion Process, Forging Operations-1. 9. Manufacturing Processes I Test 9 – This set of online test on “Manufacturing Processes I” tests your skills on Forging Operations-2, Shearing Operations, Extrusion, Deep Drawing, Metal Casting Fundamentals, Metal Solidification and Fluid Flow, Foundries Foundry Automation, Heat Transfer-1, Heat Transfer-2, Fluid Flow and Heat Transfer, Jigs and Fixtures, Engineering Metrology And Instrumentations. 10. Manufacturing Processes I Test 10 – This set of online test on “Manufacturing Processes I” tests your skills on Quality Assurance, Manufacturing Process Automation, Computer Aided Manufacturing, Computer Integrated Manufacturing, Product Design and Process Selection, Gear Basics-1, Gear Basics-2, Gear Terminology-1, Gear Terminology-2. 11. Manufacturing Processes I Certification Test - This set of online free certification test on "Manufacturing Processes I" tests your skills on all areas (all chapters, topics and subtopics) of Manufacturing Processes I. 12. 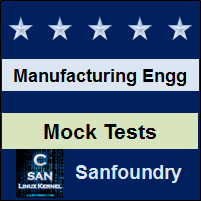 Manufacturing Processes I Internship Test - If you scored either Grade A* or Grade A in our Manufacturing Processes I Internship Test, then you can apply for Internship at Sanfoundry in Manufacturing Processes I. 13. 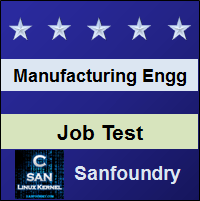 Manufacturing Processes I Job Test - If you scored either Grade A* or Grade A in our Manufacturing Processes I Job Test, then you can apply for Jobs at Sanfoundry in Manufacturing Processes I domain. Best Wishes for your Manufacturing Processes I Tests!